Gulf News | XPRESS | Sharmila Dhal, Chief Reporter | DUBAI: Dubai-based Vonita Singh is a dancer with a difference. A classical Kathak performer, she uses her vast repertoire of skills not just as a form of art, but also a means to reach out to patients suffering from Parkinson’s Disease (PD), a neurological/movement disorder. 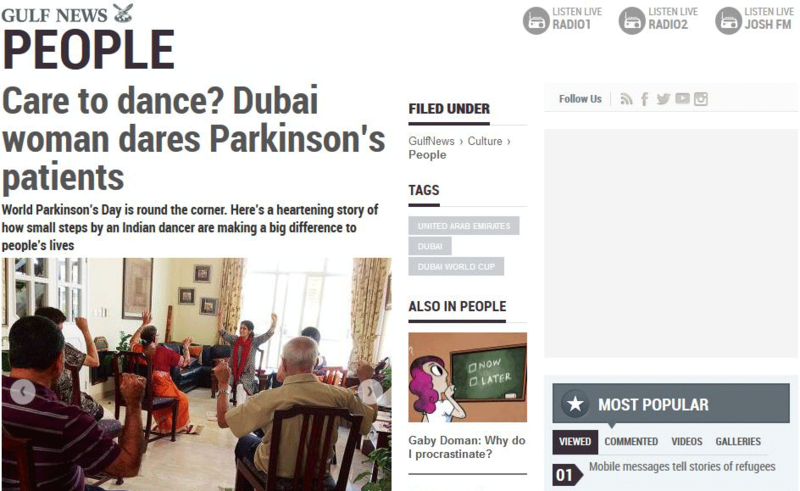 The 50-year-old Indian expat, who has a doctorate in anthropology and has undertaken a dance therapy programme in New York, has become an unlikely torchbearer for a little known community of Parkinson’s patients in the UAE, as she prods them and their caretakers to move on with their beleaguered lives. 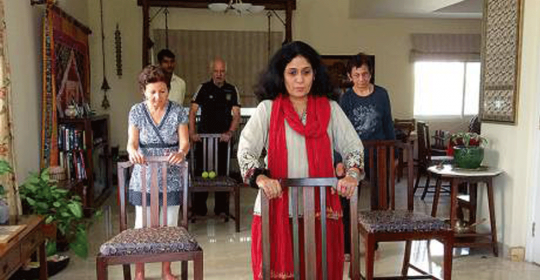 Ahead of World Parkinson’s Day on April 11, nothing perhaps can raise better awareness about the degenerative and progressive disease than the message of Movement Mantra, Singh’s free-of-charge dance classes, held at her Umm Suqeim home twice a week. As patients attend the 90-minute sessions, the simple, fun exercises that Singh teaches them help activate every muscle in their bodies. It is an attempt to keep the joints and muscles in use and thus delay the inevitable progression of Parkinson’s. “Use me or lose me – that’s the case with our muscles. So the key is to keep them going and fight rigidity, the cardinal symptom of PD which results from lack of movement,” said Singh, who was motivated to do something for PD patients after losing her father to the disease in 2009. She said PD has no cure, but certain medications alleviate the symptoms. “Besides pharmacological treatment, there are other options to improve quality of life. Regular exercise and physical therapy, speech therapy, patient education, support groups and certain diets have beneficial effects,” he added. It doesn’t matter that some patients are confined to wheelchairs or some others use walkers. Most exercises, based on elements of yoga, are sit-down affairs. She said a typical class begins with a set of warm-up exercises, followed by a few stretches. The intense, cheoreographed elements come later, at the end of which all joints and muscles from head to toe are covered. The focus is on the navras or nine emotions. Accordingly, nine scenarios are created, each requiring the patients to make a corresponding expression – sadness, surprise, disgust, laughter etc. Breathing exercises and speech therapy are also covered to activate the vocal chords, which tend to affect speech in patients. The class ends with meditation.